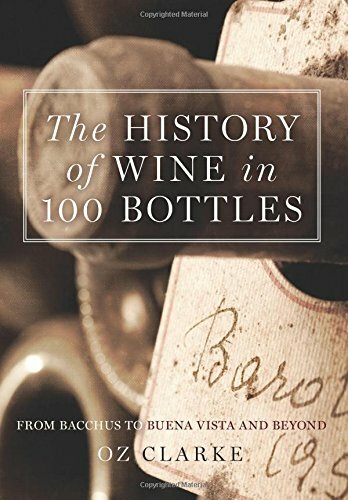 Wine books are as popular as ever, but when it comes to books about the history of wine, that's a different story. That's not a surprise, given that most readers would rather learn about new wines and trends as opposed to winemaking practices from decades and centuries ago. So the history of wine is usually relegated to an opening chapter in most books, if at all. I'm happy to report then, that British author Oz Clarke has changed all that with a wonderful new work called The History of Wine in 100 Bottles. It's a typical Clarke opus, full of wit and style; it's a breezy read and it also has dozens of beautiful images as well as the labels of the significant wines that Clarke writes about in this historical overview. What Clarke has done here is to highlight 100 historically important wines - or trends - that he believes are worth considering when it comes to a broad history of wine. Note that this is not a Top 100 list; there aren't discussions about the 1945 Mouton Rothschild, Petrus or Latour in this book. Rather the author has selected some famous wines as well as famous moments to make his argument. For example, while specific wines such as the 1915 Vega Sicilia and 1979 Opus One are among the 100 entries, Clarke is more interested in milestone moments on the history timeline. Thus entries include "The Modern Wine Bottle - 1740s", "The Concept of Chateau - 1855-1870s", a look at the famed Bordeaux classification and its role in pricing, as well as "Robert Mondavi & The Rebirth of Napa - 1966", and "Central Otago - Furthest South - 1987" about the birth of this marvelous wine district on New Zealand's South Island. Clarke also discusses "International Consultants - 1980s and 1990s", about consulting winemakers such as Michel Rolland and Stéphane Derenoncourt, who became overnight celebrities for their work in Bordeaux and around the world; and of course, the influence of Robert Parker (who was one of the biggest cheerleaders for these consultants), is another chapter in Clarke's book. The author doesn't only single out the so-called great wines, as he also writes about bag-in-box wines, white zinfandel and screw caps. I love the fact that Clarke has included these topics, as they are certainly an important part of wine's history; it also shows that he isn't so caught up with famed chateaux or hilltop Napa Valley estates - the balance of this book between celestial wines and everyday ones is admirable. Getting the last glass of wine out is not always easy. You can just cut the bag open and drain the dregs. But that means you won't be able to enjoy the bag to the full since, when it's empty, you can blow it full of air - and it becomes a very comfortable pillow. Where else would you find text such as that?